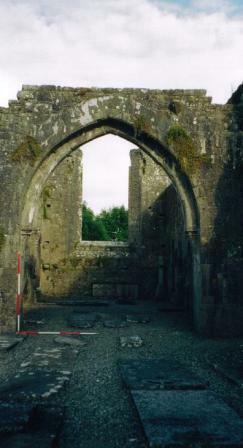 Strade Friary was established by the Franciscan friars as part of their expansion in Ireland in the thirteenth century. Its date of foundation is difficult to pinpoint exactly, it falls somewhere in the first half of the thirteenth century. It was founded by Jordan de Exeter, Lord of Athlethan and was the first religious house to be established under Anglo-Norman auspices in the area. In 1252, the friary was transferred to the ownership of the Dominicans, apparently as the insistence of Jordan’s wife, Basilia. 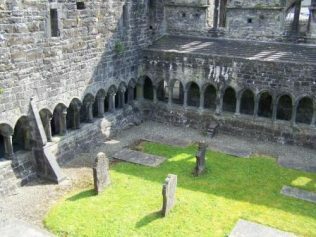 She was a daughter of Meiler de Bermingham, a prominent patron of the Dominicans of Athenry and clearly had a preference for this order which she was determined her husband would share. Her intervention is a potent example of the power a patron, or indeed his wife, could exercise over a religious house. The Franciscan friars left Mayo at this juncture and would not re-establish themselves here until the fifteenth century. Once the Dominicans took over the friary, it became a daughter house of Sligo Friary. The friary’s stormy days had not yet passed, the Annals of Loch Cé for 1254 record the burning of the friary thus: “the monastery of the Friars preachers at Ath-Lethan, in Luighne, was all burned”. This fire did not prove a fatal blow for the friary as it easily could have done, had the public support not existed to rebuild it. 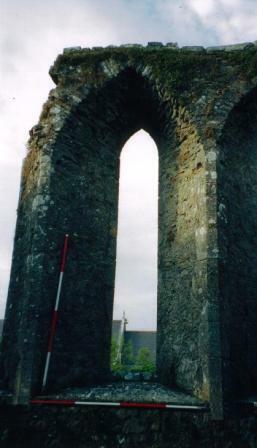 This was the case at Roscommon friary which was burned in 1270 and never recovered due to insufficient funds to permit rebuilding. Strade friary was subsequently rebuilt and the majority of the building as it stands today dates from the thirteenth and fifteenth centuries. Only the church remains, the domestic ranges no longer stand. Gallagher, N., (2004). Two nations, one order: the Franciscans in medieval Ireland. History Ireland. Vol.12, No.2, pp. 16–20. McDermott, Y. (2009). Strade Friary: Patronage and development at a medieval mendicant friary. Cathair na Mart. 27, (92-108). Ó Clabaigh, C.N., (2002). The Franciscans in Ireland, 1400–1534: From Reform to Reformation. Four Courts Press, Dublin.